It's a wonderful night at the Grand Ball for Dorcas the Donkey girl! And the Prince is coming towards her! 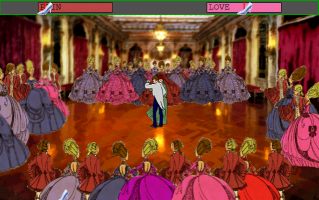 Dance with the Prince to grow his affection for you. Queen Dorcas has quite a ring to it, Does it not? A non-adventure game with a single gimmick. Can be finished in two or three minutes.